← A (PAID!) Space to Show Your Work! Won’t You Be My Neighbor? An MLK Day Event! Posted on January 11, 2019 by Kari Scott| Comments Off on Won’t You Be My Neighbor? An MLK Day Event! In response to the traumatic events of the massacre on October 27, 2018 in the Tree of Life synagogue in Pittsburgh, we will be hosting a community engagement event to facilitate conversation and a path to healing, particularly regarding neighborhood violence. 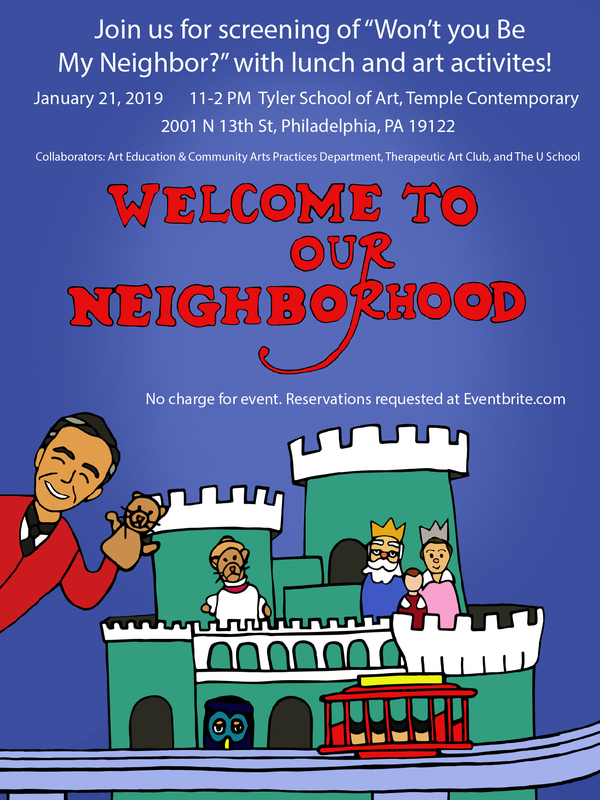 We will be screening the documentary of “Won’t you be my Neighbor”, about the legacy of Fred Rogers (Mr. Rogers’ Neighborhood), who lived and worked in the same neighborhood as the Tree of Life Synagogue. In response to the documentary we will make puppets (which will be donated to local children’s organizations) and neighborhood dioramas, and have conversations about the topics raised in the documentary (which include a wide spectrum of important topics like violence, trauma, racism, and more). It will be open to any Temple students, as well as North Philadelphia neighbors, in the spirit of bringing everyone together. This event is a collaboration between the Art Education and Community Arts Practices Department, the Temple University Therapeutic Art Club, and the U School (one of our neighboring high schools from the School District of Philadelphia). Let us know you’re coming on Eventbrite.